Occasionally I listen to interviews of actors. Not sure where I heard this one, but Alan Alda, "Hawkeye Pierce" from the very successful series M.A.S.H , once mentioned that he was very fond of spaghetti topped with tomato sauce and a bit of ricotta. Those words stuck in my memory ever since I heard them. I said to myself, he must be an Italian for only someone with Italian blood would say such a thing . And it turns out that Alan Alda, whose real name is Alphonso, has got some in him. An Italian boy born in Italy and bread in the Bronx, just like yours truly. So today, with a proud grin on my face, I decided to make a quick dish that I am sure Mr. Alda, would find very tasty. It was a big hit with the fan club, and even a greater hit than usual whole pasta is not their favorite. Whole Wheat Spaghetti alla Chitarra with Roasted Tomato Sauce. The trick to this dish was to use a homemade "tomato pesto" instead of tomato paste. I rarely use tomato paste in my sauces. I think that it is a sure way to cause you make you head out to your medicine cabinet for for some antacid, especially if you overcook the sauce. Using a food processor, make a pesto with the sun dried tomatoes, fried pepper, garlic cloves, basil and EVOO. Add the pesto to a sautee' pan where the crushed tomatoes are cooking in some EVOO. Add some water if the tomato mixture is too thick so that it does not burn and can cook for at least 15 minutes. We do not want the garlic to remain raw . When the sauce is cooked, stir in the ricotta cheese and mix well. Use the sauce to nicely coat your pasta. 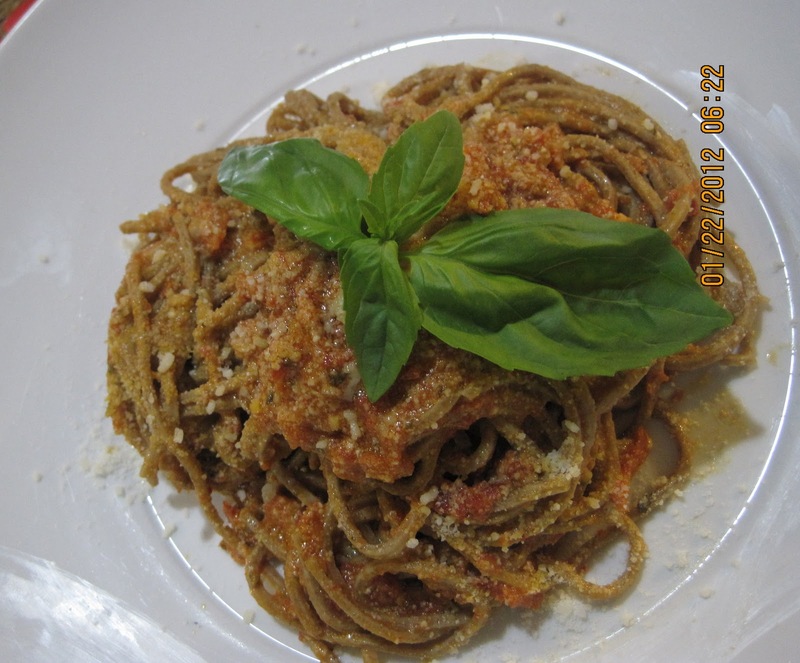 In this case, I used fresh Whole Wheat Spaghetti alla Chitarra. Top with some EVOO, and grated Romano cheese. Granish with more fried chilies if you want to spice things up. Now wasn't that simple ? Brazil's National Dish . Twice Twisted . My Melting Pot of Multiethnic Legumes.